Arris Engineering completed an MEP and FP design for a complete kitchen renovation at the Forest City High School located in Forest City, PA. The renovation included the full 5,000Sq-Ft kitchen, receiving and storage areas. 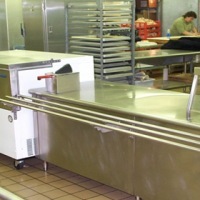 All new equipment was specified for the renovation along with a new hood and ventilation system. The cafeteria seating area and adjacent administrative offices were included in the project and were provided with new lighting systems and architectural finishes.